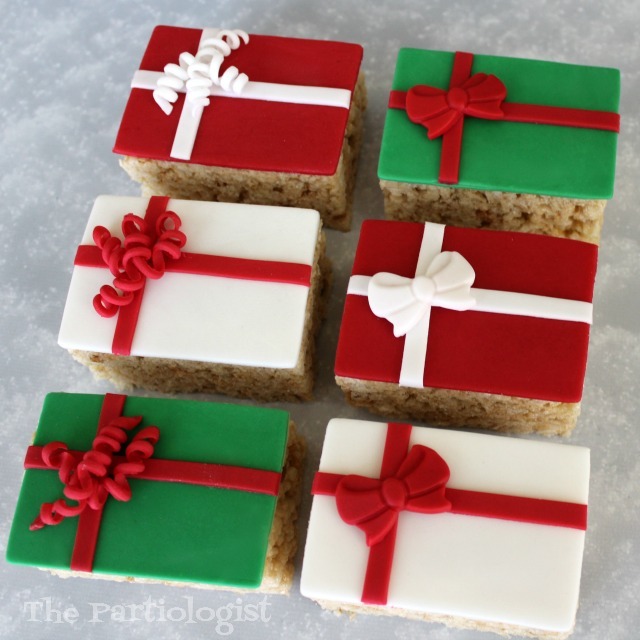 The Partiologist: Rice Krispie Treats that Look Like Gifts! 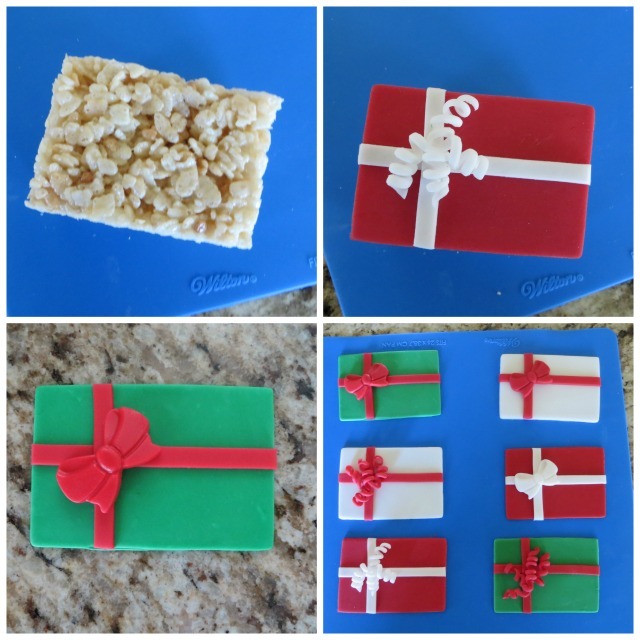 Rice Krispie Treats that Look Like Gifts! I've been wrapping gifts...with fondant. 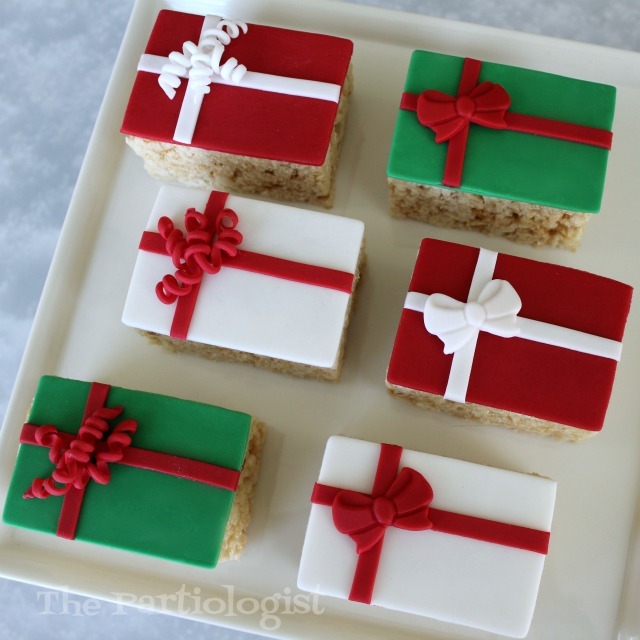 Actually I'm topping Rice Krispie Treats with Wilton fondant to look like Christmas packages. This post is sponsored by Wilton, all opinions are my own. Wilton and I go back a very long time, they may not know it, but we do. I've loved Wilton long before I had internet and now that I have internet, I love it even more! Back in the day, I (maybe I should say my mom) got catalogs and I've (we've) collected them since the 1970's. As you know, recently I attended a Fun Food Blogger Retreat and Wilton was a sweet sponsor. So I am thrilled to be able to showcase some of their wonderful products. Of course, you'll always see me using their products on my sweets and treats! When I serve any dessert, I usually dress it up by adding a little decoration usually with fondant. This is exactly what I've done with the Rice Krispie treats. Using the Wilton bow mold, made it so simple. The toppers can be made ahead of time and placed on the RKT right before serving. I decided to use the smaller pan because I wanted the bars to be thick. Cut the Krispie treat into the size you want your gifts. You'll also need white, red and green fondant. Roll out a small piece of white fondant. 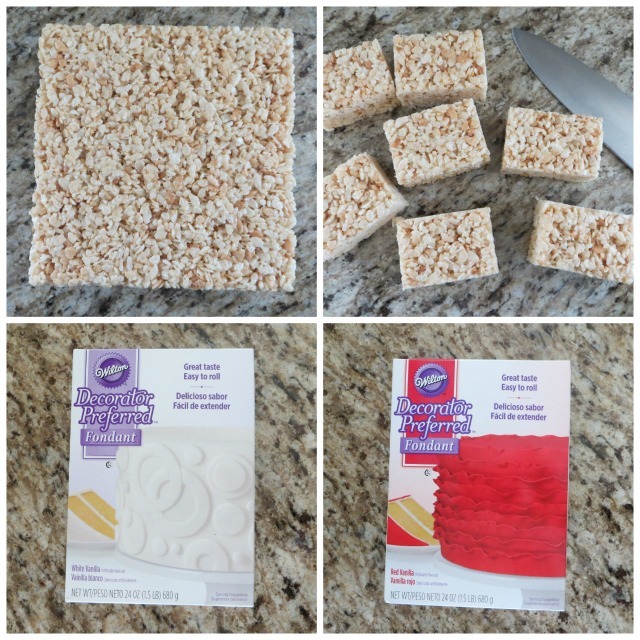 Cut with a pizza cutter or knife and food safe ruler to the size of your Rice Krispie bar. Lay the fondant on the top of the bar to make sure it covers the entire top. Press in a small amount of red fondant into the bow mold and remove excess. Press down until smooth. Next roll out a small piece of red fondant. Using a rolling mincer, cut the fondant into strips. Brush a bit of water to the back of the strip, to make the fondant stick. Lay the strips across the top of the white fondant. Roll out a long strip of white fondant. 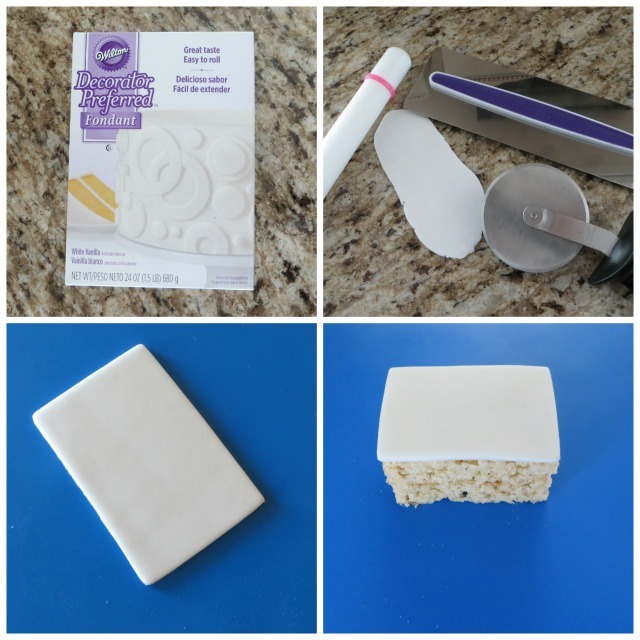 Using a pizza cutter and ruler, cut very long thin strips of fondant. 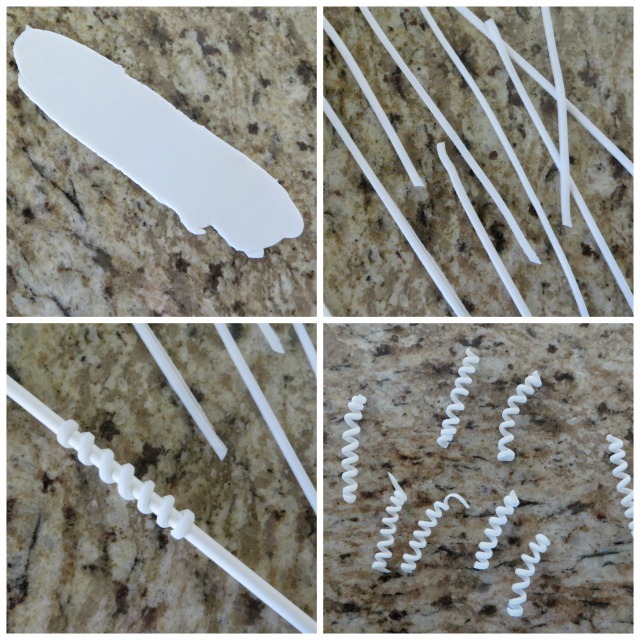 Wrap the strips around a lollipop stick. Slide off the end of the stick and let dry. 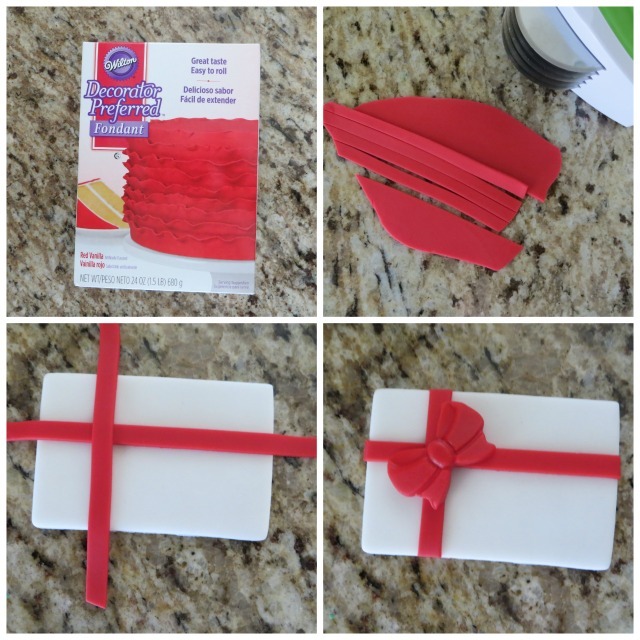 Add the small pieces of white curling ribbon (fondant) to the top of the gift. Or top it with the bow. Pour into 8 x 8 pan or 9 x 13 pan, depending on the thickness you want. 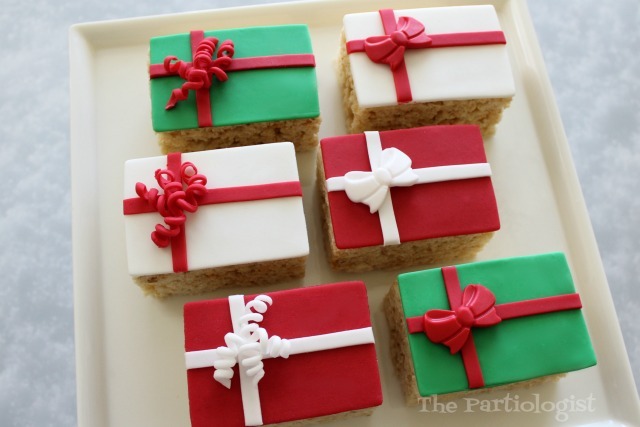 Such a pretty way to dress up a Rice Krispie Treat for Christmas or a birthday party! That's exactly what I was thinking, who wouldn't want a RKT gift? Thanks so much! 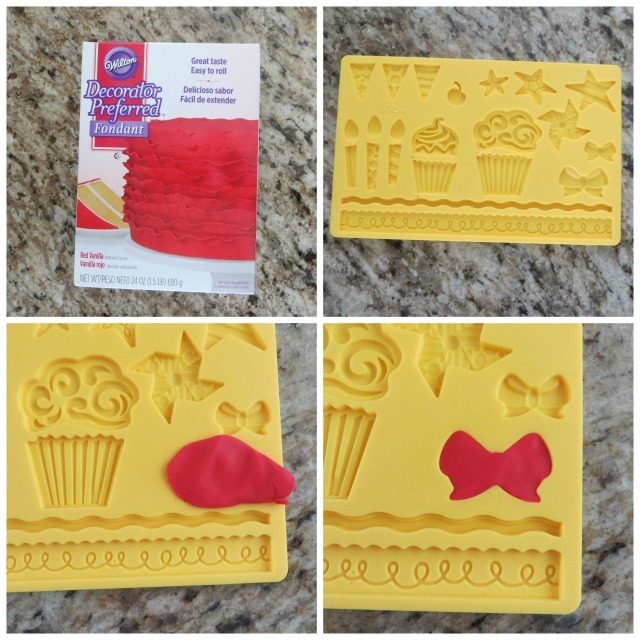 Yes, that bow mold was so easy to use, thank you for stopping by! Isn't it fun to find new uses for something you already have? Thanks for the sweet comment!